This is the best insurance for your Ruger 10-22 Takedown. Prevents the receiver end of your barrel from getting damaged from accidents and mishandling and prevents the receiver from getting polluted from dirt and debris. 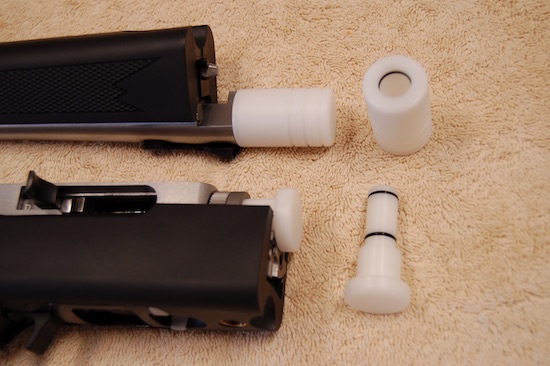 O rings on both protectors keep you rifle engagement clean and secure on your rifle. Here installed properly and ready for putting away in your Ruger pack. The real solution to keeping your Ruger 10/22 Take Down in perfect working order on any kind of adventure. Machined from solid White Delrin rod. Maximum lubricity and a visual aid for debris contamination. 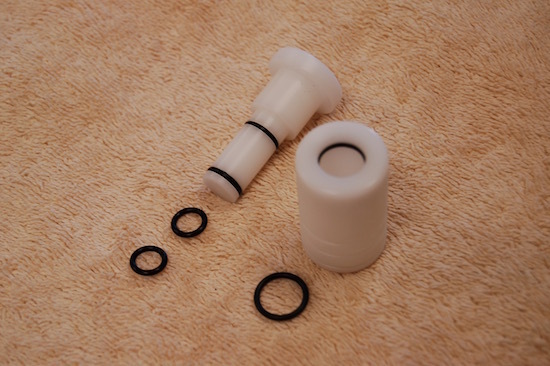 Buna O-rings for wiping the surfaces clean during installation and removal. Precisely engineered for the Ruger 10/22 Take Down. PRICE: $34.99 Free shipping in the USA. California destinations sale tax applies.